After making probably the most commercially and artistically successful album of all time, how does a band live up to that for the next record? 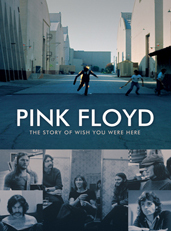 In the case of Pink Floyd, the result was 1975’s Wish You Were Here, the follow-up to the mammoth record Dark Side of the Moon. But it wasn’t exactly easy, as documented in this excellent new documentary that goes into the making of truly one of Floyd’s best records. Featuring new interviews with surviving members David Gilmour, Roger Waters and Nick Mason, the DVD shows a band that was kind of at a creative crossroads in to follow-up Dark Side of the Moon. In the end, Floyd came up with a perfectly seamless record that dealt with several themes: the sense of absence (also reflected in the classic album artwork by designers Storm Thorgerson and Aubrey Powell); the record industry; and most importantly, Syd Barrett, the group’s former member and chief songwriter. It’s tragic of what became of Barrett after he left the band, especially when he showed up looking physically different to people at the studio where Floyd was making Wish You Were Here—he’s certainly the focal point of the record as he was in the early history of the band. As for the album itself, the documentary tells the behind the scenes stories of each of five songs: the epic “Shine On You Crazy Diamond,” “Welcome to the Machine ,” “Have a Cigar,” and the poignant title track. Other interesting touches are the interviews with Roy Harper, who sang lead on Have a Cigar; backing singer Venetta Fields, and the stuntman whose burning image graces the album cover. Although a commercial success in itself, Wish You Were Here seems underrated when compared to Dark Side of the Moon and The Wall—however, one can make the argument that Wish You Were Here kind of surpasses those records in its own unique way.